Odds are that right now, somewhere in the world, someone is performing Carl Off’s Carmina Burana. Wildly popular, the Carmina Burana begins and ends with “O fortuna,” one of the most frequently performed pieces of classical music, featured in countless films, TV shows and commercials. 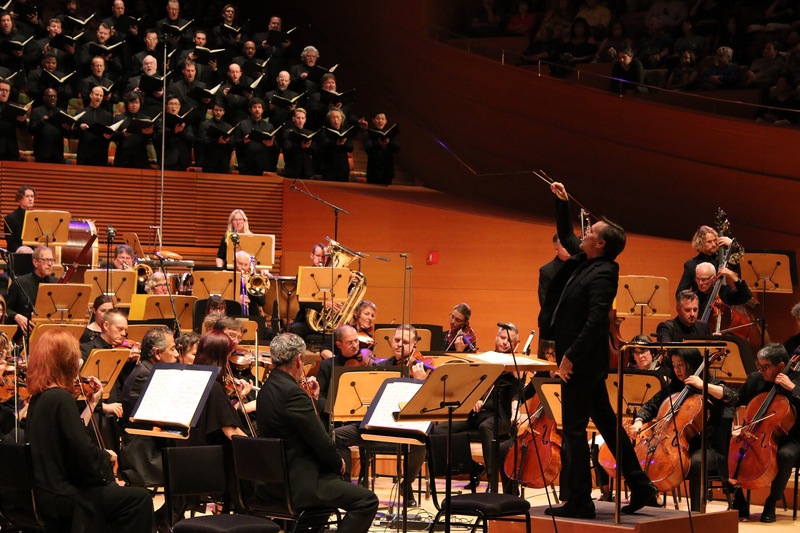 On Saturday, the Los Angeles Master Chorale opened its season with performances of Carmina Burana and Leonard Bernstein’s Chichester Psalms. 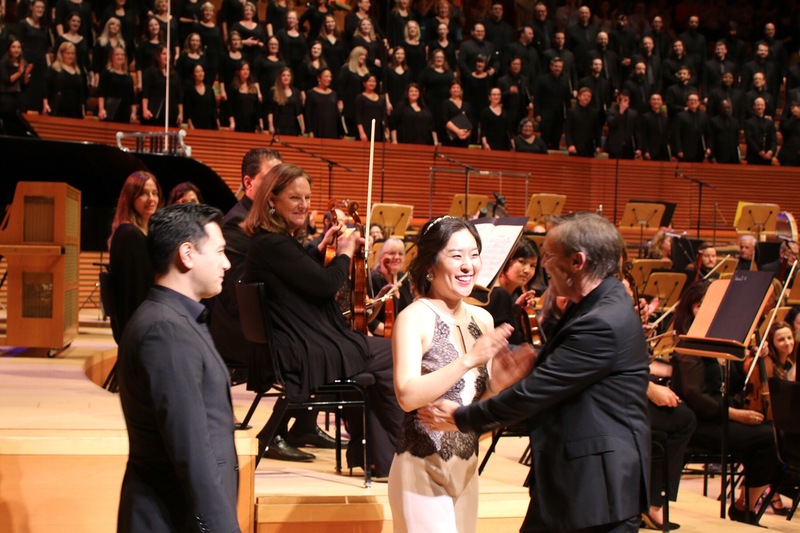 It was an inspired pairing: an extremely popular 20th Century work performed with the less famous work of one the most successful composers and conductors of the 20th Century. Next year marks the 100th year anniversary of the birth of Leonard Bernstein. To celebrate this milestone, this season, many music arts organizations have programmed his works, including the Los Angeles Master Chorale. First performed in 1965, Chichester Psalms is a choral work with solos by a countertenor or boy soprano. With its exuberant rhythms and hushed intonations, it’s a great showcase for a great chorus. Except for a few mis-steps in the horn section, the Master Chorale’s performance of Chichester Psalms was very successful and deeply moving. Singing in Hebrew, the Master Chorale performed with haunting beauty, especially in the final movement. Special mention must be made for boy soprano, Jaimie Felix-Toll whose bell-like voice filled the hall with innocence, as well as clarity. The Chichester Psalms performance was solid, but the Carmina Burana performance was sensational. The opening “O fortuna” started slowly and I wondered if the Master Chorale needed a slower tempo for accuracy. Boy was I mistaken! The Master Chorale responded brilliantly to the work’s demands. From the rage of “O fortuna” to the revelry of “In taberna quando sumus” to the innocence of “Amor volat,” the Master Chorale performed with striking mood and emotion. The concluding “O fortuna” was taken at breakneck speed, producing an overwhelming finale. Though primarily a choral work, the Carmina Burana features three soloists. Baritone Stephen Powell sang with power, expressiveness – and a wicked sense of humor. “Ego sum abbas” was as boisterous, as it was well-sung. Lovely-voiced soprano So Young Park embodied the virginal innocence of “Stetit puella” and nailed the tricky, stratospheric, staccato notes of “Dulcissime.” Both Powell and Park made a for a saucy couple in “Tempus es iocundum.” Tenor Nicholas Phan struggled with the high tessitura of “Cignus cundus cantat,” but compensated with broad theatricality and hilarious timing, bringing the house down. Artistic Director, Grant Gershon has worked with the Los Angeles Master Chorale and Orchestra for more than 15 years. Gershon knows how to bring the best out of the Master Chorale and conducted the orchestra with confidence and exuberant spirit – though that exuberance drowned out the Master Chorale at times. Posted in Entertainment and tagged carmina burana, classical, classical music, l.a. master chorale, leonard bernstein, los angeles master chorale, o fortuna. Bookmark the permalink.